Visible Ink Press : Which president was a junior varsity football coach? 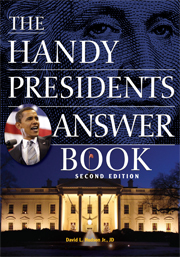 Which president was a junior varsity football coach? He was one of four presidents that never held a public office before the presidency. He was named president of Columbia University. He served under generals like George Patton, John J. Pershing and Douglas A. Macarthur. His famous campaign slogan was "We Like Ike." What did Eisenhower do after graduating high school? Eisenhower entered the U.S. Military Academy at West Point in 1911 and graduated in 1915. He excelled at football for the army before suffering a knee injury. His knowledge of the game impressed the coaches, who asked him to coach the junior varsity team. What was unusual about Eisenhower as president? Eisenhower was one of only four presidents in history (the others being Zachary Taylor, Ulysses S. Grant, and Herbert Hoover) who never held public office before the presidency. Prior to 1952, it was uncertain which political party Eisenhower would support. Both major political parties courted him as a candidate. Eisenhower described himself as a "liberal Republican." What was his next non-military position? Eisenhower was named president of Columbia University in 1948. He was largely a figurehead. Under which famous generals did he work or serve? He worked, served under, or learned from many famous generals, including George Patton, Fox Conner, John J. Pershing, and Douglas A. MacArthur. Patton taught him much about tank warfare. Conner served as a key mentor to Eisenhower, teaching him military history and strategy. Some dubbed him "the man who made Eisenhower." Eisenhower referred to Conner as "the ablest man I ever knew." Pershing sent Eisenhower to the Army War College, and then to France. MacArthur taught the junior officer administration and attention to detail when Eisenhower served under the famous general's staff in the Philippines and elsewhere. What were Eisenhower's catchy campaign slogans? His 1952 campaign slogan was "We Like Ike." His 1956 campaign slogan was "Peace and Prosperity."